Terrain: The first 12 kilometres to Waterfoot is exactly what you already went through the day before - flat, scenic, and easy. You stay on the A2 (also known as the Causeway Coastal Road/Antrim Coast Road) until Cushendun, and then you have a choice. Either turn inland which is a steady incline but shorter, or pedal along the coast through Torr Head, which is longer with quick, sharp climbs but has views and corresponding downhills to compensate. Do the inland route. Trust us. 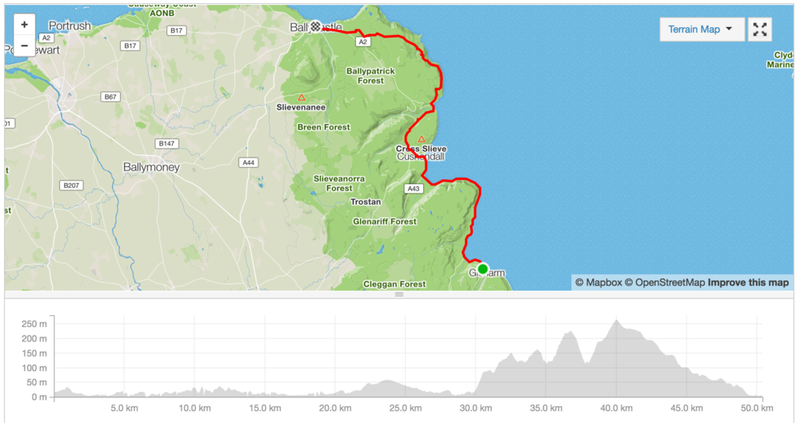 Our original route idea was to follow the Antrim Coast Road to Cushendun and then follow the road slightly inland for some countryside action. We knew this would mean some climbing, although it didn't look too bad. But after yesterday's shenanigans in the glens, we were open to suggestions, given our lack of low gears and the long road that still lay ahead of us. Peter proceeded to tell us about the coast route via Torr Head, the closest point to Scotland, affording marvellous views of Mull of Kintyre. Whilst it was admittedly "rugged", he confidently assured us that this was the lesser of two evils. So once the morning's bike-tweaking session was done, we packed up our gear, said our grateful goodbyes, and set off. They'd heard we were coming. The first 20 kilometres were an absolute breeze. We quickly found our rhythm, and with the Sunday morning stillness, the sun, and the beautiful scenery, it was almost meditative. Before long, we'd forgotten all the rain and hardship of the first days, and it was just after noon when we sailed into town for our first tea break. Cushendun is a tiny, quaint town that mostly belongs to the National Trust, an organisation which owns many historic properties in the UK and ensures their preservation. The Corner House Cafe is the perfect place to sit for a wee breather whilst enjoying the scenery. Neil looking out to sea, pondering how to fix our troublesome gear shifter. Like on the first day, we faced a choice of routes right after this break. Either way, there was going to be a climb heading towards Ballycastle so our rationale was that we might as well get some views out of it, which is why we decided to take Peter's advice and follow the right fork towards Torr Road. The morning shift had been so effortless and the weather was very much on our side, so we thought, "How bad could it really be?" Minutes later, we were on foot, pushing the bike up a monster incline and cursing the day we were born. Have you ever pushed a loaded tandem weighing well over 50kg up a 20% incline? No? Good. Keep it that way. Especially don't do it when you're wearing bike shoes, as the cleats will slip and wear out, and you'll get nowhere fast. Up and down, up and down for two hours, admiring the admittedly tremendous scenery and understanding why there was virtually nobody living here any more. Cut off by sea on one side and bleak, mountainous moors on the other, this was no place to make a living. Stone houses, their thatched roofs long since rotten away, stood testament to those who calculated that sailing across the Atlantic would be less arduous than trying to make ends meet here. Grunting our way up these vicious inclines was made all the more annoying by the fact that the day before, the aforementioned Giant's Causeway Coastal Sportive had gone through this same way (although how in the feckin** hell anyone was able to get up this beats us) and the organisers had left motivational signs up along the course, purely to mock us. When you're breathing through your arse in the middle of a steep climb and the wind is blowing so hard it feels like the invisible man is trying to push you over, the last thing you want to see is a sign that says, "This is what all that training was for!" At least there was plenty to look at as we got our breath back. "I CAN BEAT THIS RAWRRRR", said Neil which prompted hysterical laughter from Jess because God himself couldn't overcome this. "Whose idea was this anyway? ", said Neil. This is whose idea it was, and the grin hides her utter hatred of her life at this moment. No traffic, though! And no wonder. Jess was absolutely convinced that she was going to die up here. There was nothing for miles, barely a passing car, and turning back around was out of the question when you had invested so much of yourself into making it this far. The only solution was to keep pushing on. In the end, we beat it. We reached the top of the final climb, and would have stopped to enjoy our accomplishment had it not been for the wind, which by this point had got up to Force 6, and left us in fear of our safety on the long, gentle descent to Ballycastle. In any other circumstances, ten kilometres of downhill riding after all that would be cause for celebration, but in these conditions it was a nightmare as Neil fought against the bike's murderous intent, and Jess put everything she had into counterbalancing us while the wind slammed into our side. We had never been so happy to see the road sign welcoming us to Ballycastle, as the trees buckled and broke in the gale. P.S. : If you ever stay at the Water's Edge in Glenarm, tell Peter that we're going to kick his arse. *"Youse" - a colloquial Norn Iron term meaning "you all". **"Feckin" - a lovely euphemism for its more foul sibling.